The Westcott 40.5" 5-in-1 Collapsible Reflector is versatile in the field and in the studio, providing shadow-lightening detail in your subject, using available, or studio lighting. It starts out as a translucent white disc -- perfect for softening direct sun, or lights without diffusion. Use the removable, reversible zippered slipcover to reflect light into shadow areas of your subject. Your choice of color -- silver, gold, white, black mix -- will be determined by the lighting conditions, and your personal preference. This 40.5" (1 m) disc is suitable for 3/4 length portraits, and medium still-life setups. It folds down to 1/3 its open size, and comes with a storage sleeve. We suggest the purchase of a pivoting arm and stand, to hold the disc where needed -- especially if you are working without an assistant. To order this disc with a stand and an arm: Click here. Silver increases the specular highlights and yields a high-contrast image. It's perfect for video, product shots and B&W photography. Gold produces a natural, golden fill that is great for sunsets, jewelry, and indoor portraits. White produces an even, neutral-colored bounce light that works beautifully as a fill light source for both product shots and indoor/outdoor portraits. The black side diminishes unwanted reflections or color casts. Translucent fabric is used to diffuse light, producing a broad light source and a soft, wraparound effect that's perfect for outdoor portraits or whenever a softer light is needed. Box Dimensions (LxWxH) 15.9 x 15.5 x 3.25"
5-in-1 Reflector Disc - 40.5" (1 m) is rated 4.6 out of 5 by 227. Rated 3 out of 5 by MBR Tony from Great except for zipper Good size for working outdoors - big enough to get soft light, but not so big that you'll fly away on a windy day. Many kits don't include black, and I'm glad this one does because there are times where a gobo is necessary and it's one less item I need to bring along. The down side, though, is the zipper for the reflector panels. I treat things very delicately, and after only three color changes, the zipper got stuck, and then actually broke. So, get a few little clips as well for when the zipper breaks. Rated 4 out of 5 by Karl T. from A moslty excellent reflector Mostly excellent because is does what it claims to do very well. It collapses easily and stores in its bag easily. It does an excellent job, well, reflecting light. It's also a great defuser. It's a very nice portable reflect/defuser. he only issue I have is when changing the color of the reflector. It unzips easily and can then be turned inside out to change the colors. Slide the strap through the opening in the cover and then start piping it back up. Here is where the problem lies, the zipper gets stuck occasionally while zipping it up again making it hard to change quickly. Despite this issue, I still recommend this product. Rated 4 out of 5 by Anonymous from Great Product I do a lot of outdoor portraits and this reflector is exactly what I was looking for. It's large enough to use with a couple of people in the shot but still folds up into a small enough package to travel easily. As others have noted in their reviews, getting the zipper closed after a color change can be a challenge but you just have to take it slow. One trick I learned was to keep the reflector from putting pressure on the zipper while closing it and it closed without a problem. But I wouldn't recommend trying to use it on a windy day. It might lift you off the ground. Rated 4 out of 5 by Anonymous from Money well spent! I had been thinking of buying good reflectors for some time but an assignment for a fashion photo shoot highlighted the urgency to get them. I got the pack and used them for some shots for outdoor portraits in the sun. I used either the Golden reflector or the Diffuser for most of my shots and really excited with the results. The size of the reflector is excellent and quality very good. No regrets. My only issue for the shoot was that I did not have a reflector stand and used one of my friend for assistance. I would definitely invest in a stand to make sure I am not always dependent on someone. Rated 5 out of 5 by Anonymous from Never leave home without one. This is the one tool all photographers, digital, video and film must have in their gear at all times. Nothing compares to it in terms of versatility, portability, and usefulness. As it is described you have five functions in one lightweight, compact product. Bounce light in either silver, gold or zebra, or use as a negative fill with black or use the diffuser to soften your light. Useful both in the studio or exterior shoots. Tips; Put your name and contact info on it somewhere highly visible to deter would-be thief's, and keep the cover on your belt as a reminder that it's on the job. If lost or stolen it's not a tool you can live without and you'll find yourself buying another very quickly. Rated 4 out of 5 by Karen from Useful, awkward to fold This does what it's supposed to, and the larger size is perfect -- not quite necessary to use a stand (although it would help), so it's useful for outside. I read about and was wary of the zipper problems that some people have had with this, but I have had no problems with that at all. I've taken it in and out of the case several times, reversed the cover, and although the zipper is tight and requires a bit of care, I've not had any problems with it breaking or not closing. It is awkward to fold due to the size, and I notice that when open, it seems slightly crooked, not flat. But not bad, and certainly not enough to affect its usefulness. The material quality seems very good, not flimsy. Rated 5 out of 5 by Jeff from Great First Reflector This is my first reflector, but the size is awesome. I have found myself using as a background in some situations for product shots as well as a reflector outdoors. It fold up small enough I can almost fit it entirely into the laptop portion of the Think Tank Street Walker HD. I am still able to slide it in, just can't zip the compartment up completely but thats how I walk around with it. Rated 5 out of 5 by Anonymous from Great for basic fashion photography I bought the reflector because my girlfriend asked me to take some head shots of one of her actress clients. I'm not a professional photographer and had never done head shots before. Use of the Westcott reflector definitely reminded me that in photography, light is everything. The Westcott works just as advertised - the white creates a soft even light and beautiful skin tones, the silver more striking highlights, and the gold gives that sunset light. Didn't use the diffuser or black, but I'm sure they'll come in handy one day. And the whole thing folds neatly in a small carry bag. As for the photos, they were great, some went out to agents the next day, now if she can only land a part. Great product, even at twice its price! what is the difference between this and the Westcott basics 5 in 1 reflector? There is basically no difference. 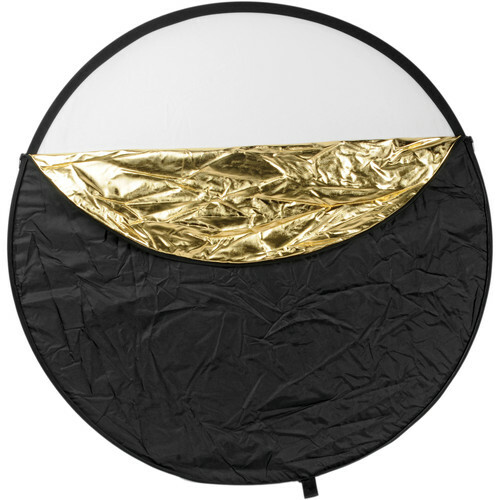 Have used this reflector many times and very happy with it. I believe it's cheaper than the Wescott.